The House of Representatives has approved bipartisan legislation to “modernize” the Internal Revenue Service, but proposes to do this without providing new funding. As a result, the plan is sure to fail. The agency needs to hire and train auditors and other officials, replace ancient IT systems, and improve customer service. All this comes at a cost. The agency’s budgets and payrolls have been declining since 2010, when Republicans deliberately started gutting the agency. In 2017 the number of auditors dropped to fewer than 10,000 for the first time since the mid-1950s. In turn, the proportion of returns subject to audit dropped to just 0.6 percent, the lowest in 15 years. And things are only going to get worse: As many as 40 percent of IRS employees could retire this year. 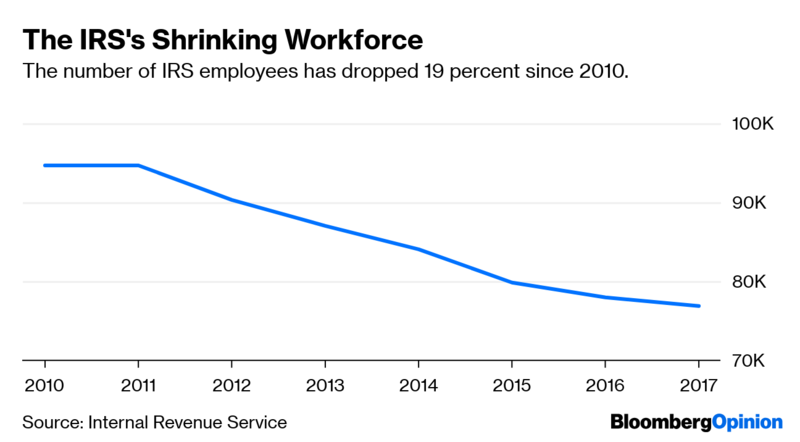 The number of IRS employees has dropped 19 percent since 2010. A failing IRS is a bigger problem than you might suppose. Most Americans feel obligated to pay their taxes, but lax enforcement starts to erode that sense of obligation if cheating is seen to work. This calls the legitimacy of public finance into doubt. Adding to the IRS budget is fiscally smart, as well, since every additional dollar spent on the agency generates at least $4 in revenue. For lack of resources, an estimated $400 billion is owed but unpaid. As well as more money, audit priorities should be adjusted to generate more revenue. Right now, workers focus on easy cases — such as low-income families who may be erroneously claiming the earned income tax credit. Instead, the IRS should target pass-through entities, for instance, which are among the least audited and the most likely to be claiming questionable expenses or using tax-avoidance schemes. (The 2017 tax law gave new benefits to pass-throughs, making this problem worse.) An effective oversight board is needed, too. Congress should approve an adequate multi-year funding plan for the IRS, so it can start to implement some of the plans it’s already put together, such as online accounts to make it easier for taxpayers to deal with the agency. It’s good that Republicans and Democrats were finally able to come together and support tax-related legislation, especially for the IRS, which has been the victim of partisanship. Too bad their Taxpayer First Act doesn’t, in fact, put taxpayers first. —Editors: Alexis Leondis, Clive Crook.